In the vacuum tube audio world, perhaps the most rarefied air is reserved for OTL or ‘output transformerless’) designs. As the name suggests, an OTL design directly couples the output from the tubes/valves to the transducer itself (or at least, to the crossover of the transducer in most cases), avoiding the need for a transformer. The problem for most OTL designs is that the high output impedance of valves is not a good match for the low impedance of most loudspeakers. This meant banks of valves were required to drive most loudspeakers, and that meant lots of heat, and lots and lots of tube replacements (David Berning’s hybrid Z-OTL circuit being the exception). However, in the personal audio world, where headphone impedances are typically one or two orders of magnitude higher than most loudspeakers, many of these problems simply go away, and the OTL amplifier should be more commonplace. The reason it’s not is the design process requires more knowledge than simple copying. All of which means the Feliks Audio Euforia (made in Lubliniec, Poland) so damn remarkable. The amplifier is a single-ended OTL design (like I said… headphone impedances make that possible), using two new old stock 6N13S/6AS7G power and a choice of 6SN7 driver tube pairs (typically, the 6SN7 of choice is the Psvane CT181-TII Gold). These are fed by a custom made toroidal power transformer and the circuit features solid-state ripple suppression and rectification, while all the internal wiring is hand-soldered Teflon-coated pure silver cable. The component roll-out is similarly high-spec, with a quality Alps volume pot, and Mundorfs and Nichicons under the hood. 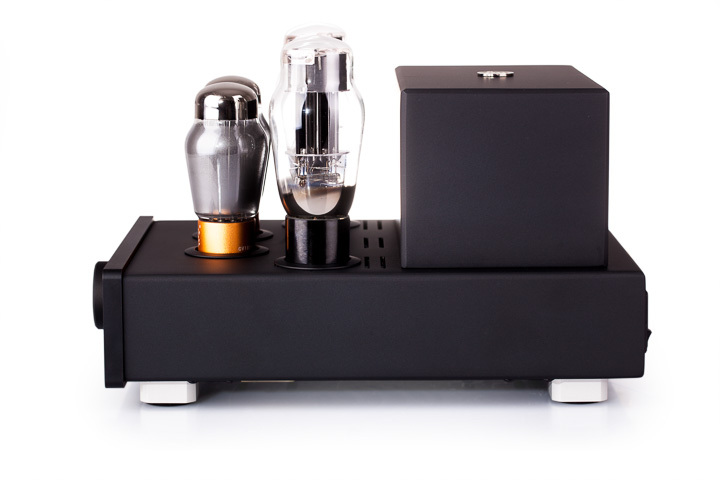 The Euforia is small, if you are used to handling valve amps… light, mostly basic in operation, and very, very well made. The ‘mostly basic’ nature of the amplifier means there is but one stereo RCA input, and a matching line output. There is a power switch next to the inlet on the rear, a central volume control, an indicator light, and a ¼” headphone jack on the front. With one exception, that’s it… no channel switching, balance, or remote control, and no provision for a valve cage: you are on your own recognizance not to burn, cut, or electrocute yourself here, so no amp juggling! It even autobiases, so there is no need for multimeters and no glowing LED indicators to dial out. The one exception to its basic specification is a rear switch, marked like the track crossing section on a Scalextric track. This is a ‘Cross-Feed’ circuit, which deliberately injects a small amount of low-frequency crosstalk into the two channels. This sounds contra-clever, notionally making stereo imagery less accurate in the process, but in reality, what it seems to do is draw images out from their ‘lateralised’ position inside the front of the listener’s head, and is particularly well-liked both by traditional stereo listeners, and those who listen for hours at a stretch. This is not my first rodeo with cross-talk introduction, as it was briefly popular in the mid-1990s when hold-out vinyl lovers were trying to come to terms with the ‘perfect sound, forever’ of CD. By adding a small amount of low frequency crosstalk to a digital circuit, many would report a more ‘natural’ soundstage and less fatiguing listening. Feliks Audio recognises this is more to do with the listener’s preference than specific recordings, so the Cross-Feed switch is set near to the power button. Experiment, then fit and forget.